Also known as "geoengineering," it is the intentional large-scale intervention in the Earth’s climate system to counter climate change. Limiting the risks of climate change requires swift and deep reductions in emissions of heat-trapping gases and investments to prepare for now unavoidable impacts. Given the daunting challenge of keeping the rise in global temperatures in check, some researchers are also working to understand the risks and potentials of “geoengineering” or climate engineering technologies. Climate engineering is the intentional large-scale intervention in the Earth’s climate system to counter climate change. It includes techniques to remove carbon dioxide from the atmosphere, and technologies to rapidly cool the Earth by reflecting solar energy back to space. 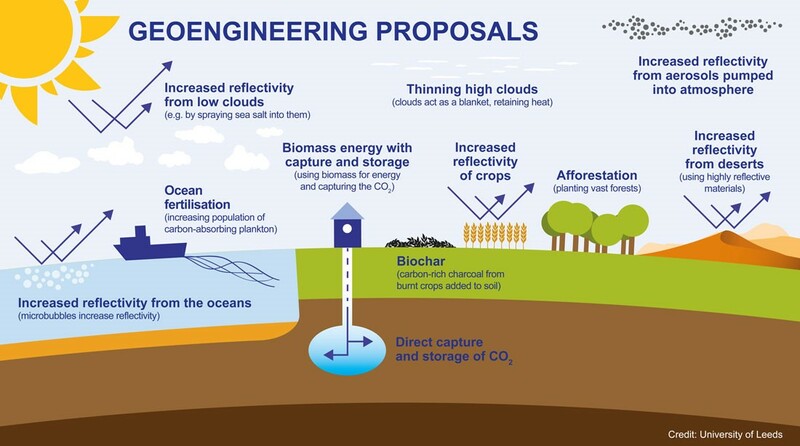 Some proposed climate engineering technologies are highly controversial, spurring global debates about whether and under what conditions they should be considered, and reinforcing the pressing need for the US and other nations to commit to aggressive reductions in heat-trapping emissions. The Integrated Assessment of Geoengineering Proposals, University of Leeds. Some carbon dioxide removal techniques (CDR), like reforestation, are well-understood. Others entail using technologies to capture and sequester carbon dioxide that are in early research stages or currently are difficult to deploy at large scales without high costs or substantial negative impacts on energy use, water or land. Solar geoengineering, or “solar radiation management” (SRM) refers to technologies proposed to rapidly cool down Earth’s temperature. Proposals include simulating the cooling effects of volcanic eruptions, and enhancing the reflectivity of marine clouds. When volcanoes erupt, they spread into the atmosphere tiny particles, commonly known as "aerosols." Light-colored aerosol particles can reflect incoming energy from the sun in cloud-free air and dark particles can absorb it. A small fleet of aircraft, for example, could conceivably inject sulfate aerosols or other reflecting particles into the stratosphere and drive large-scale cooling. Marine cloud brightening proposals entail using sea salt to “seed”—stimulate the formation of—low-altitude clouds over the ocean, enhance their reflectivity and extend their lifetimes. These SRM techniques are also at early stages of research, primarily based on computer modeling. SRM technologies would not limit some of the most serious impacts of rising carbon dioxide concentrations, including ocean acidification. Some climate scientists want to start atmospheric field experiments with sun-reflective aerosols and other solar geoengineering technologies to further understand their risks and potential benefits. Other scientists and civil society advocates caution, however, that we lack effective mechanisms for global society to consider the risks and potential benefits of these technologies and make informed, well-governed decisions about further research and potential deployment. They warn of the risk, or “moral hazard,” that investments in solar geoengineering may diminish efforts at reducing net carbon emissions through proven and affordable means like renewable energy, and that they also may increase geopolitical conflict over “who decides” what the climate goals of deploying SRM would be. Computer modeling of SRM techniques show, for example, that reflecting sunlight away from the atmosphere may substantially alter rainfall patterns. These preliminary findings indicate that we don’t have the full picture of how geoengineering will affect local and regional weather patterns, and therefore geopolitics. Forums like the Carnegie Climate Geoengineering Governance Initiative (C2G2), and the Solar Radiation Management Governance Initiative (SRMGI) intend to start a global conversation about the scientific and ethical implications of geoengineering. They aim to include different voices and concerns of stakeholders from developed and developing countries about the potential governance of geoengineering research and possible deployment. With atmospheric field experiments in solar geoengineering proposed to begin in the next few years, there are many issues that should be addressed in advance. These include taking steps to ensure that research is well-governed, that it is carried out only if a broad and representative range of civil society stakeholders grant their informed consent, and that research is funded transparently, and only by governments and other entities fully committed to aggressive reductions in carbon emissions. Solar geoengineering field research, if it is carried out, must be in the context of a primary commitment from the US and other nations to deep and aggressive reductions in heat-trapping emissions.